Patrick Rothfuss is the author of the Kingkiller Chronicle trilogy, with the first two books—The Name Of The Wind and The Wise Man’s Fear—having landed on The New York Times bestseller list, and the third eagerly awaited. He recently published The Slow Regard Of Silent Things, a story about a Kingkiller Chronicle side character, Auri. 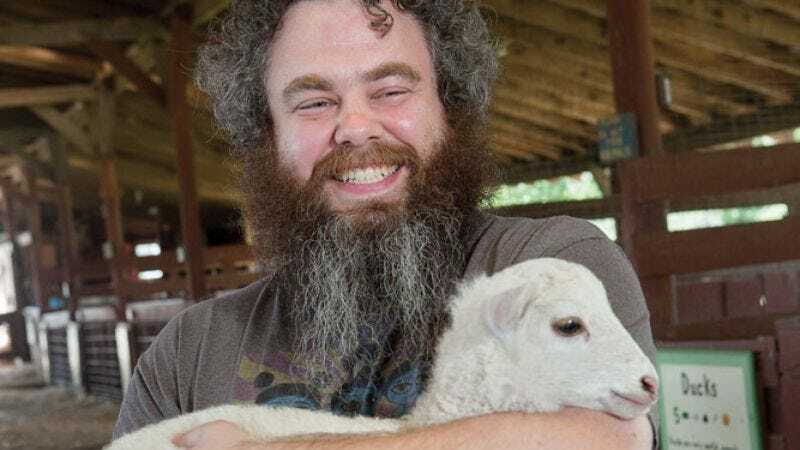 Rothfuss also runs Worldbuilders, a charity that raises funds for Heifer International by selling and auctioning off books, games, and fun miscellaneous stuff having to do with The Kingkiller Chronicle and other sci-fi and fantasy books. He joined us to talk about his relationship with his fans, writing Auri, and his charity work. The A.V. Club: Is there something special about the community of fantasy and sci-fi authors and readers? Patrick Rothfuss: Well, I’m not the most objective person to ask, you realize—but yeah. I think there is. First off, I think authors tend to be more empathetic than a lot of people. It’s almost a job requirement. You can’t write good characters if you can’t imagine what it’s like being in another person’s skin. And if you can imagine that, you naturally want other people’s lives to be better. You want to make that happen. I think the same is true for readers, in a lot of cases. Reading can almost be viewed as empathy training. Movies have better action scenes, sure. But books are uniquely suited to showing you the inside of another person’s head. That is the root of empathy. That’s the first step to understanding you’re not alone in the world. Lastly and most importantly, in sci-fi and fantasy, you tend to get a lot of geeks. We’re game players—system manipulators. We do the math. We want elegant, efficient, powerful solutions to problems. We think, “I’ve got 20 bucks—what can I accomplish with this money? If I buy a sack of rice, people eat it and it’s gone. But if I buy chickens, a family gets eggs every day. And eggs turn into more chickens, which then make more eggs? And can’t the family sell the extra eggs and make money for themselves, too?” Geeks like to game the system. We play to win. Heifer is an easy choice for people like that. AVC: Why Heifer International, as opposed to a different charity? PR: Simply said, it’s the best value for your dollar, charity-wise. They’ve been doing this for 60-plus years. They’re veterans. They don’t just feed hungry people. They give people the tools and education they need to feed themselves. Forever. I could talk forever about what makes Heifer great. I’m very persuasive on the subject. But these days I don’t have to go to all that work. I just tell people that it’s one of the few charities Bill Gates backs. His foundation has given Heifer $50 million over the last couple years. Bill Gates is not a chump. AVC: Are you trying to beat Bill Gates with Worldbuilders’ donations? I mean, the Rothfuss ring sold for $12,850. Assuming Worldbuilders keeps growing—a couple years down the road you could totally lap him. PR: I’d love to get to the point where we could beat Gates. But that’s probably at least a couple years away. Still, over the years we’ve raised more than $3 million. That’s not too shabby for a buch of bookish geeks. That said, I’m hoping that if we can get the word out about this year’s fundraiser, we’ll be able to beat last year’s total—we raised $680,000. I’d love to make this our first million-dollar year. I’ll admit that’s a bit of a pipe dream, though. AVC: Speaking of dreaming: What was it like getting into Auri’s head for The Slow Regard Of Silent Things? She’s such a singular character. PR: I’m always happy to talk about writing. That’s close to my heart. And Auri is one of my favorite characters. It was a lot of fun. Hard, as she’s a very different character, but I learned a lot about writing as a result of doing the book. Strangest thing, though? She has a very strong voice that I worked hard to bring into the book. Since then I find myself using her speech patterns—some of her verbal mannerisms have rubbed off on me. AVC: Is there any possibility of hearing more of her voice in the future? PR: You’ll definitely see more of Auri. As for seeing more of these shorter stories that center around a single character, you’re not the only person to ask. Simply said, yes. I probably will do more of these in the future. The Slow Regard Of Silent Things is actually my second story along these lines. I already wrote a Bast-centered story for the Rogues anthology that George R.R. Martin put together earlier this year. So now I have a taste for it. It’s fun giving these characters center stage for a while. They each have their own lives that only get glimpsed in the main series. Elodin seems to be the obvious choice for the next story. But I think I could do a lot with Chronicler or Devi or Simmon. I’ve had little ideas for stories surrounding Ambrose and Denna, too. But first I’ve got to focus on book three. That’s my main priority right now. And my family. Book three and my family are my main priorities. And the charity. Book three and Worldbuilders and my family are my three main priorities right now. AVC: Every time I visit the Worldbuilders website, the image I see is of a goat with a beard smoking a pipe while on a laptop. Is that image done in your likeness? PR: I’ll admit to having certain goatish characteristics, but alas, I do not smoke a pipe. AVC: How does the charity work? PR: In a nutshell, authors, publishers, and fans donate stuff to the charity, mostly books and games. Then we use that stuff to raise money for Heifer International. The vast majority of it we give away donation-style to everyone who donates on our team page. Some of the more specialized items we auction off, though. AVC: What sorts of things? PR: My thought is, if you’re a book lover, you’re going to enjoy winning a book even if it’s not something you’d ordinarily pick up on your own. It’s a chance to expand your horizons a little. But some items, folks would squee over, and other people would just throw them away. For example, this year we had about a dozen folks offer to read and critique unpublished manuscripts for aspiring authors—seasoned professionals, editors, authors, agents. If you’re not a writer, there’s no reason for you to care. But I would have killed for that back before I was published. We auction other things, too—rare books, signed art, jewelry. A few brave authors are putting cameo appearances in their upcoming books on the auction block. AVC: What’s your favorite piece you’ve auctioned off? PR: My favorite single item is probably the copy of Stardust Neil Gaiman gave us. It’s a beautiful book, an advance reading copy, but signed, numbered, in its own posh slipcase. Very rare. Someone won it in the lottery in 2009 and donated it back to Worldbuilders, telling us to auction it off and make more money for Heifer. So in 2010 we auctioned it, and someone won it for $2,500. The winner told us his mother had recently passed away, and he used the money she’d left him to buy the book. Then he donated it back to Worldbuilders, telling us to put it in the lottery next year so someone else could win it. You can read the whole story on my blog if you like. AVC: Speaking of stories—one of the best and most novel “items” you auction off is a Rothfuss trading ring, which can be used to trade in a favor from you. You’ve done this in past fundraisers—how has it turned out? PR: Ah, yeah. The favor ring. That’s a strange idea that’s been surprisingly successful. I remember throwing that into the second fundraiser just for fun, then being a little stupefied when the bidding hit $15,000. Since then it’s become a recurring prize in the fundraiser. This year, for the first time, I’ve put three of them into the lottery, where anyone can win it so long as they donate at least 10 bucks. AVC: Do you feel a foreboding sense of anxiety with these things? PR: That first year, absolutely. I remember thinking, “Someone’s going to want me to dress up as a cowboy and—I don’t know—read Byron while spanking them with a fish or something bizarre like that.” But that hasn’t happened. Someone cashed in their favor to have me visit their old college and talk to the students there about writing. Another person cashed in their favor so they could have dinner with me and just chat. Part of me’s a little worried about the three rings I’m putting in this year’s lottery, though. That’s a lot of favors I’m obliged to fulfill. Though I expect at least one of them will get cashed in for an opportunity to beta read my next book before it comes out. That’s only a little terrifying. AVC: I won’t ask when that’s going to be. Instead I’ll ask how Worldbuilders came about. I hoped I might get lucky and raise $5,000 bucks—double up on my contribution. But I didn’t realize how many people read my blog. And I underestimated the geek community. By the end of the month, people had donated more than $60,000. AVC: Did you actually match that? PR: Well, I’d promised. So I did. It zeroed me out—left me completely broke. That led to some trouble, as I was still a newbie and didn’t realize since I was self-employed nobody had been withholding taxes from my royalties. So there I was, broke, and I owed a lot of taxes. Despite that, it was the most fun I’d had that entire year. It felt better than hitting The New York Times bestseller list. I’d been broke before, but I’d never been broke for a good reason. AVC: How did all the other authors get involved? PR: It started that first year. People started sharing links to my blog, and other authors started emailing me, saying, “Can I donate some books, too? Can I help out?” Gaiman helped us spread the word too that first year. That was huge for us. And it was a big deal for me, personally, as I’m a bit of a fan. Every year it’s gotten bigger. More and more authors help us spread the word. People make jewelry for us. They knit hats. Someone forged copper knives a while back. Artists donate their time and energy. These days publishers come in to sponsor the charity, giving us thousands on thousands of books. We had a couple game publishers coming in this year, too, so we have, quite literally, $100,000 worth of games we’ll be giving away in addition to the books. That’s new for us. These days, our biggest challenge is getting the word out to people. We’re giving away a ton of cool stuff—things that simply don’t exist anywhere else. But a lot of people haven’t heard of us. We’re trying to change that by making more noise on the Internet, doing some strange things. We’re bringing in members of the Geek Glitterati to do whimsical things for stretch goals. AVC: What sorts of strange things have you got this year? PR: When we hit the half-million dollar mark, the folks behind Homestar Runner are going to make a Strongbad video for us. They’ve been on hiatus for a long while, so if you watched their stuff back in the day, that’s kind of like hearing the Beatles are coming back together to do a song. Author Kevin Hearne is going to perform “Thriller” for us with a dance troupe. Nika Harper wrote and performed some dinosaur limericks. We’re getting a bunch of authors to record themselves reading their one-star reviews. Hank and John Green are in the mix, too—but I don’t want to give away all our secrets here. Rest assured that it’s like a great geek circus over there. We’re adding new stuff every day. You should come check it out. One of my favorite things this year is Gaiman’s stretch goal. Last year he read Green Eggs And Ham for us. But this year, he’s letting donors vote on what he reads. Right now it’s a race between Where The Wild Things Are and Jabberwocky. Though Fox In Socks is still in the running. PR: Well, I’ve done a few things. But if we manage to beat last year’s donation total, I’ve agreed to kiss whatever animal the donors vote for. Right now 53 percent of the vote is for llama, which is kind of terrifying. Because llamas are like a cross between a camel and an angry Viking. I’m worried that I might get slightly trampled to death. But, you know. For charity, I’ll risk it.